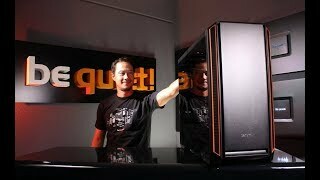 SILENT BASE 601 | BLACK silent premium PC cases from be quiet! be quiet! Silent Base 601 Black delivers the perfect combination of maximum silence and an excellent usability for remarkably quiet configurations. The front, top and sides are equipped with extra thick dampening mats of 10mm, resulting in maximum stability and superb noise dampening capabilities. The decoupled PSU bracket and HDD cages also minimize vibrations. The full metal body provides stability for the case and improves its haptic. Two pre-installed Pure Wings 2 140mm fans with airflow-optimized fan blades ensure a perfect airflow and solid cooling. The integrated 3-step fan controller caters for up to three fans. The PSU shroud perfectly covers the cables, PSU and contains a double HDD cage. The cover plates are separately detachable to install a 140mm fan on the top. With the small cover detached a 360mm radiator can be installed at the front. Using the PSU bracket the power supply unit can be easily installed from behind. 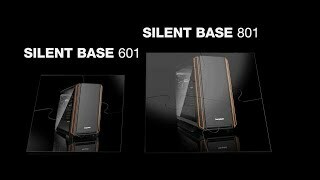 Despite its compact design the Silent Base 601 provides generous dimensions and cutouts even for installing an E-ATX motherboard. The smart arrangement of components also allows multiple graphics cards and large coolers to fit in well. With its optimized design Silent Base 601 is the perfect case for water cooling. Radiators of up to 360mm can be installed at the front, top and rear. Using the detachable bracket radiators can be installed very quickly and easily at the top.